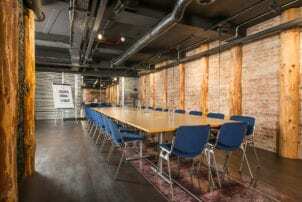 297 Euston Road, the new headquarters of the Institute of Materials, Minerals and Mining, is now available for hire for meetings, events and functions. Situated in a bustling area of zone 1, the building fronts onto both Euston Road and Warren Street and is located within one minute’s walk of Warren Street underground station, with exceptionally easy access to most of London’s mainline railway stations, Eurostar, and future Crossrail and HS2 connections. The building has been carefully redesigned to create unique and multi-functional spaces in a clean and contemporary setting. The rooms provide perfect spaces for conferences and meetings and the impressive Bessemer Suite can be transformed into an events space to accommodate awards ceremonies and product launches.